Upgrade for guaranteed next day delivery to the UK and international tracked and signed for everywhere else. For quick delivery to the UK – choose UPGRADE at checkout- this is Royal Mails Next Day Guaranteed Delivery – please do still allow 1-2 days for processing the order though, thank you. The full cost is £8.30 and includes packaging. For quick delivery anywhere else in the world – choose UPGRADE – this is a Tracked and Signed Delivery that aims to deliver within 4-7 days worldwide. Please note that I cannot control the speed at customs so it may take longer especially during busy seasons. Please do still allow 1-2 days for processing the order for you in addition to the delivery time frame. If you need it faster still please get in touch and I will do my best to help. International Standard to everywhere else in the world: £5.35 – £5.65 depending on location. As standard they are sent in a lovely Mailer box. OR you can add the Gift box option. Your order will arrive in a Mailer box automatically unless you add gift boxing to your order. 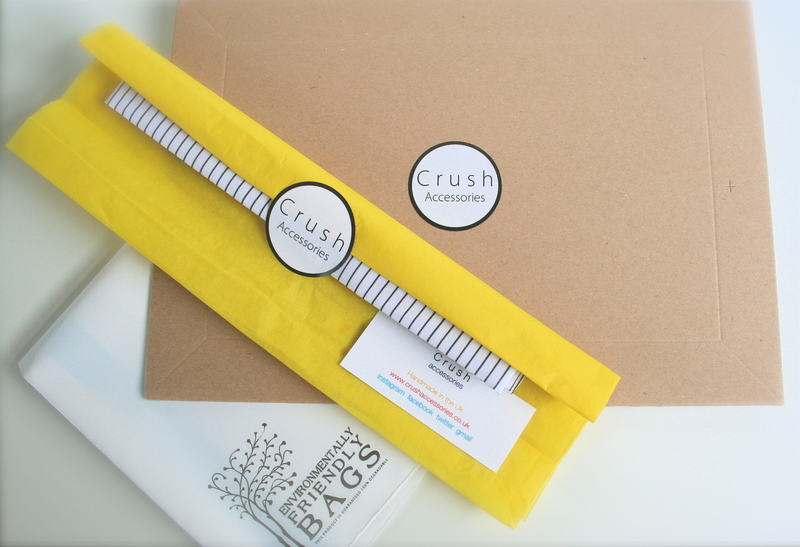 This is my standard delivery and allows me to use the most economical postage price for you. Each item you order is individually tissue wrapped and sealed with a CRUSH logo sticker ready for gifting. 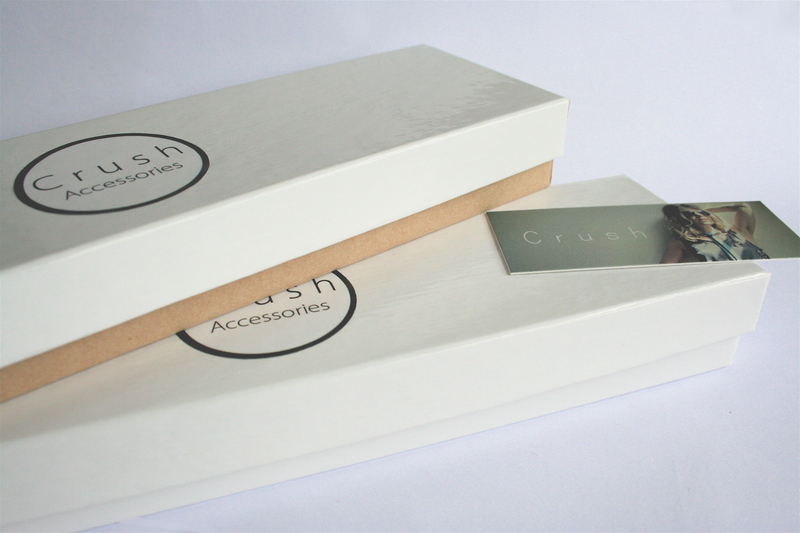 Your items are then carefully packed into the branded Mailer box and sent off to you inside a white environmentally friendly mailing bag. You can upgrade to a gift box for just £1.40 extra per box. 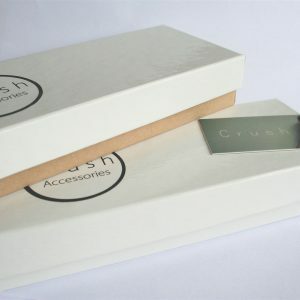 If you would like your purchases sent to you in a gift box you can add them here or from the Gift Box page listed under INFO. When ordering more than one item in a gift box, please let me know if you would like any items grouped together. For example, I can fit up to 4 skinnys together in a skinny gift box and 2 collars in a collar gift box. Because they are so light the postal cost for sending you ONE OR MORE GIFT BOXED ACCESSORY is the same as sending you ONE GIFT BOXED ACCESSORY. So you can treat yourself and a friend for the same price. The only additional cost will be the gift boxes. If you would like your order sent directly to someone other than yourself as a gift we can replace the thank you card with a gift card and write your message on it. Please add your message in the notes at checkout. Everything to the UK is sent using 1st class Royal Mail with proof of postage. Everything oversees is shipped with proof of postage. At present all orders with crush are accepted via Paypal. You do not need a Paypal account to use this method though, your bank will direct the order safely and efficiently for you. Your order will be dispatched within 1-3 business days. Items that are made to order can take up to one week and you will be notified by email as soon as your order is ready and on its way. Orders going to a UK address are usually delivered within 1-3 days. For International orders can take up to 10 days as customs can delay delivery.